A raucous multi-heist crime comedy, Lock, Stock, And Two Smoking Barrels throws everything at the screen. A lot of it sticks, but the film often threatens to disintegrate under its own weight. 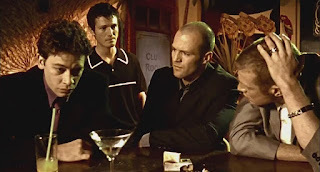 In London, friends and small time criminals Eddy (Nick Moran), Tom (Jason Flemyng), Soap (Dexter Fletcher) and Bacon (Jason Statham) pool their money and plan to win big at an illegal poker game run by "Hatchet" Harry (P.H. Moriarty). Meanwhile, Harry instructs his chief henchman Barry "the Baptist" (Lenny McLean) to steal two precious rifles from a bankrupt estate. 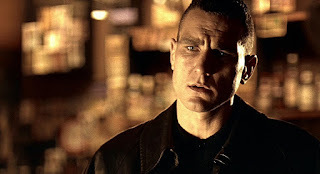 Big Chris (Vinnie Jones) also works for Harry as an uncompromising collections man, and he incongruously completes his assignments with his young son Little Chris. Barry hires bumbling thieves Gary and Dean to pull off the rifle heist, and thanks to their incompetence the stolen rifles end up with Eddy's acquaintance Nick "the Greek" (Stephen Marcus), infuriating Harry. The poker game goes badly for Eddy, and he is forced to come up with a lot of money in a hurry. An opportunity arises when he eavesdrops on his neighbours, hardened criminals led by Dog (Frank Harper) and planning a heist of a marijuana grow-op run by mellow potheads. Eddy and his friends plot to steal from Dog, an ill-advised move to begin with, but things get a lot worse when crime lord Rory Breaker (Vas Blackwood) turns out to be the main victim of the marijuana theft, and sets out to extract bloody revenge. The directorial debut of Guy Ritchie, who also wrote the script, Lock, Stock And Two Smoking Barrels is an enjoyable over-the-top thriller, filled with colourful characters, bizarre incidents, madcap stand-offs and cacophonous shoot-outs. The film is set in a twilight zone free from any law enforcement intervention, where everyone is a crook with varying degrees of violence propensity, and almost everyone is male. Ritchie's criminals speak with heightened self-awareness, the dialogue a stream of witty put-downs peppered with cockneyisms, north versus south disparagement and never ending vulgarity. The action scenes combine a high bullet count with punctuations of humour. The cameras look away from the bloodiest carnage, Ritchie more interested in intricate set-ups and immediate aftermaths, or capturing in slow motion some of the weirder action on the edges of the main event. But it all does get to be too much. Between Eddy's crew, Harry's shop, Dog's gang, the weed growers, the idiot thieves and Rory's operation, Ritchie crams six separate groups of guys into his movie. With a relatively economical running time of 106 minutes, narration is pressed into service to try and sort out who's who, the screen time is fragmented into narrative blurs, and no characters emerge as anchors. The film becomes a case of more is less, as there is only so much joy to be squeezed out of random guys threatening other random guys with painful exits. Lock, Stock And Two Smoking Barrels is stylistically enjoyable, the film's elevated energy just about overcoming a case of too many crooks.